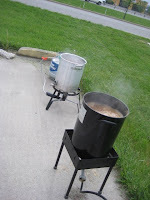 This year's collaborative Big Brew with the Half Moon got off to the usual false start. 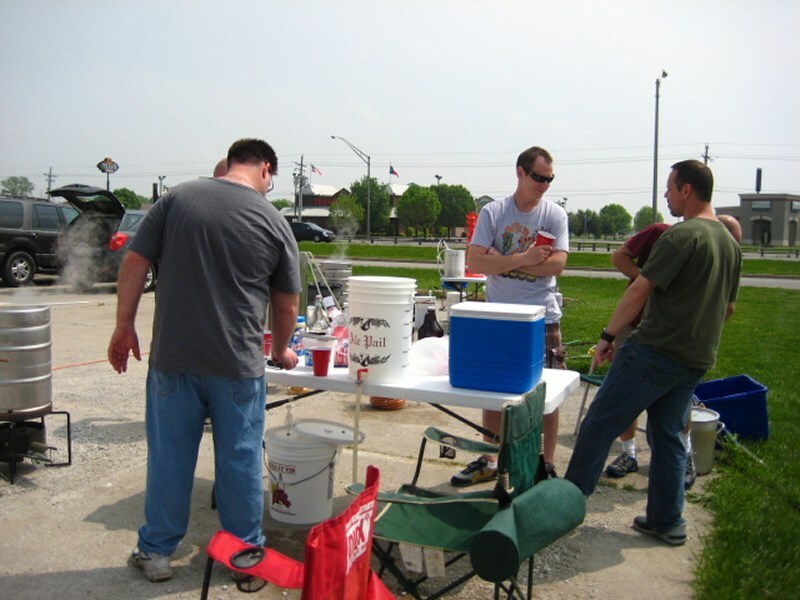 The initial day set to be on National Homebrew Day was called on account of rain and was pushed back a week. The weather forecast leading up to the big day was less than favorable. 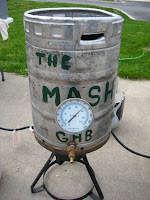 But Tom made a gutsy call to give John at the Half Moon the go ahead on Friday to whip up a batch of wort for us to brew on Saturday. 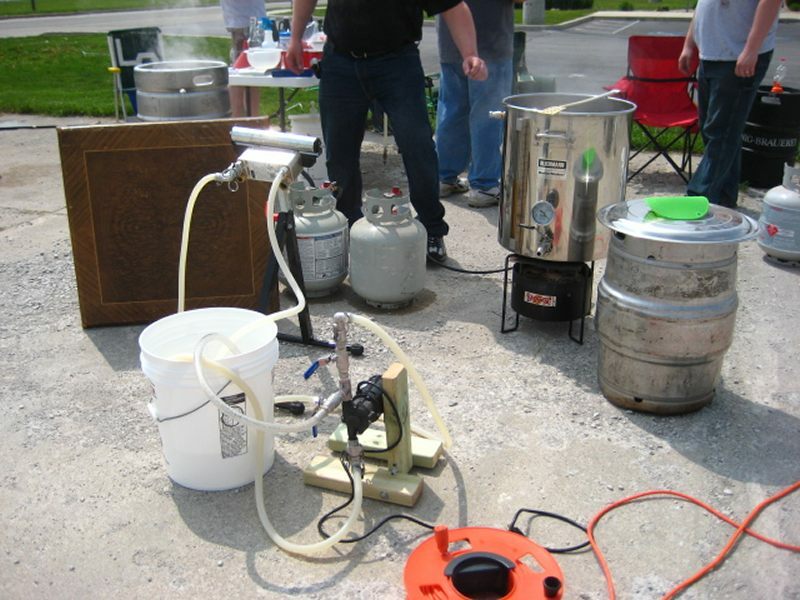 We got to do what we wanted with the hops & yeast. 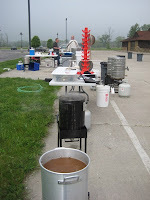 The morning was grey & foggy when we set up, but the rain looked like it was going to hold off for the brew. 9 brewmeisters set up 7 rigs to brew. 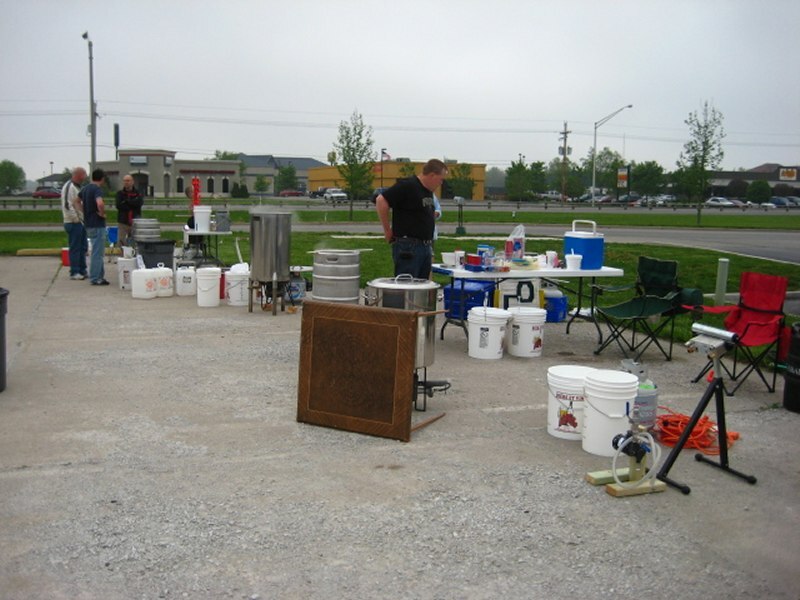 Its always interesting to see the variations in every brewer's rig. There seems to be an near infinite number of ways to do the same thing. Some setups were an impromptu collaboration of what was available. This particular combo of Tom's keg boil pot and Jon's "beginner's" cooker was not the best pairing. 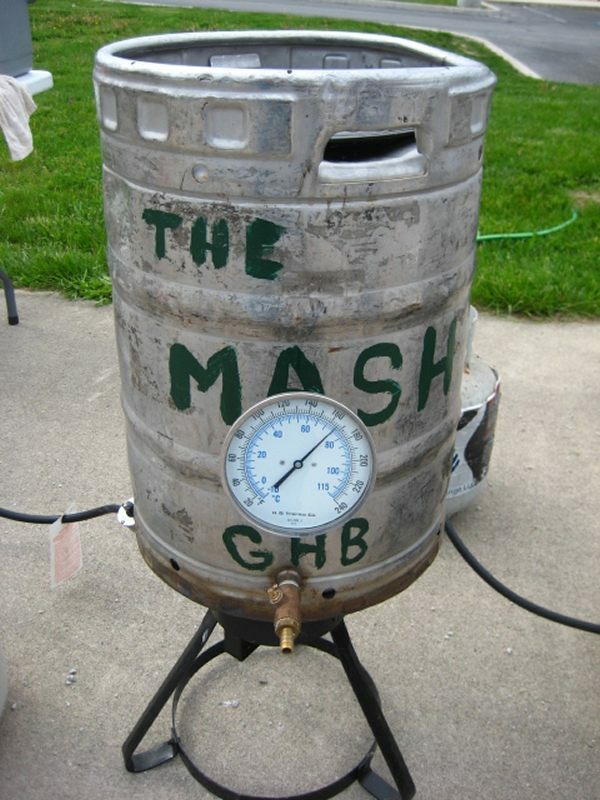 It merely maintained the mash out temp until a real burner was freed up. 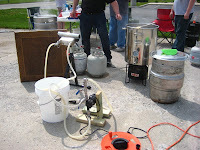 There were a couple of homebrews brought out. Jon hadt his "Here, taste this" beer for a critical evaluation of what went wrong. Brent had his diacetyl beer for recommendations as well. Interestingly enough, it appears as though the problem with both of these beers could be yeast related. 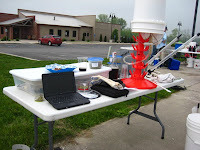 Jon's was a re-pitch on top of the yeast cake and then sat in the primary for about a month so there was probably a lot of old dead yeast addding to the funk, while Brent's was racked to the secondary in just a few days not giving the yeast time to reabsorb the diacetyl. We had several club members stop by to see the goings on. We even had Andrew, one of the club's founding members make the drive north to visit. 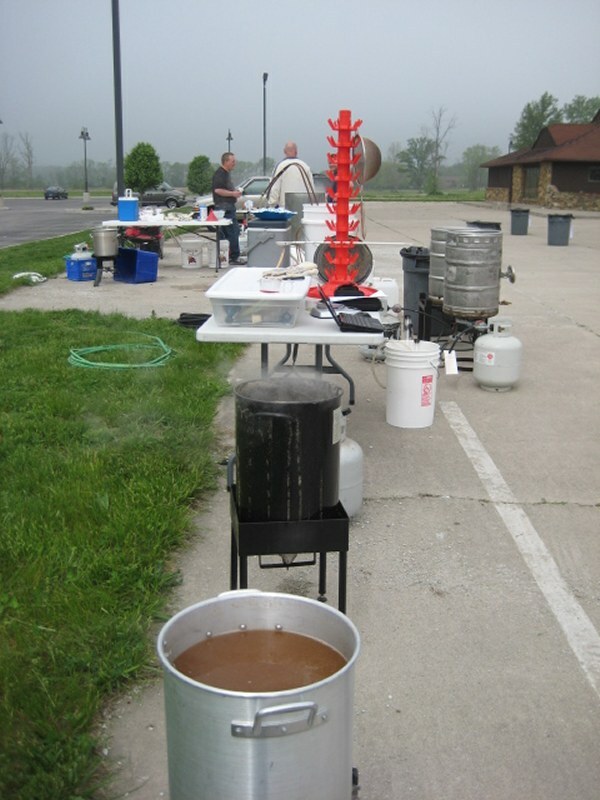 Once again, many thanks to John & Chris of the Half Moon for the generous donation of the wort for this club project. The growlers John brought out were much appreciated as well. I saw several people taking pictures, feel free to add them to this blog or create a new one with your own story on the day. Good write up. Good times. Hopefully good beer.